“Pixar is a creative company that has made it a priority to constantly re-examine itself, but even in a company like ours, certain leadership impediments can become impossible to see, and detrimental calcification can set in. Bill and his partner Bob have captured the essence of the wisdom and the tools they bring to helping leaders in Scaling Leadership. • Identify your own personal balance of leadership strengths and weaknesses. • Scale relationships to amplify effective leadership qualities. • Proliferate high achievers in your organization’s leadership structure. • Diagnose ineffective leadership and course-correct quickly. Sign up for more information and updates for Scaling Leadership. How do you navigate our increasingly complicated and volatile world such that you scale new and innovative solutions to complex business, organizational, and global problems? The answer is transformational leadership! Scaling Leadership is the just-in-time guide for those in positions of senior leadership who need to transform their organizations and organizational leaders. Scaling Leadership is an essential guide that offers senior leaders the information needed to develop conscious leadership at scale within their organization. You are the key to transforming your organization. You do this by mastering and scaling transformational leadership. Located outside of North America? Click here for international retailers. People wonder if leadership is something you’re born with or if it can be learned—improved with knowledge, practice, and feedback. The answer is an unequivocal yes! Featured in chapter 8, Jeff Hilzinger has shown us that leadership can be learned, honed, developed, and scaled. Jeff has taken his natural ability and built on it, mitigated his liabilities, and adopted new leadership practices that make him a highly effective leader. Click the video to listen and watch Jeff describe his 10 year leadership journey with us. -John Mackey, Co-founder and CEO, Whole Foods Market, Co-founder, Conscious Capitalism Inc. 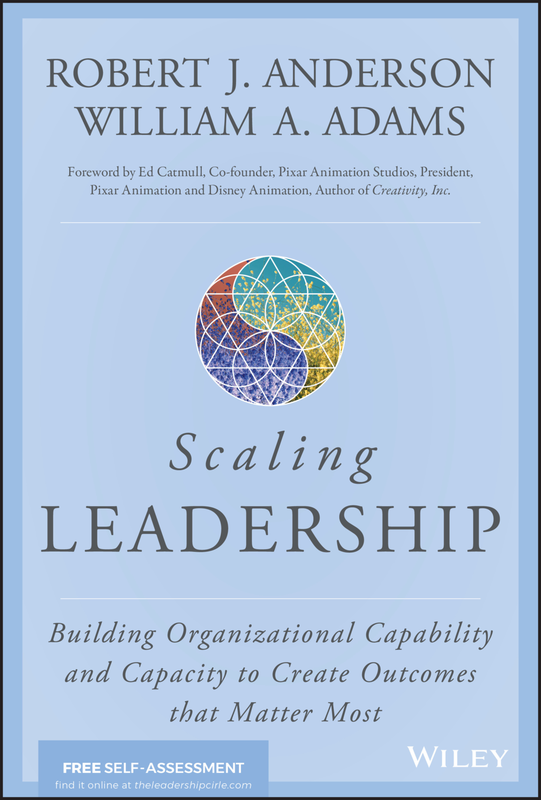 Scaling Leadership delivers the most street-savvy, evidence-based and conscious leadership approach on the planet. If you want to future-proof your organization, thrive in the face of rip-roaring change, and cultivate a flourishing world, then drink deep from the wisdom of these pages and then share it with every leader you know. Robert J. Anderson has been a pace setter in the field of Leadership Development for over 30 years. He is the Founder, Chairman and Chief Development Officer of The Leadership Circle and Full Circle Group and the co-author of Mastering Leadership: An Integrated Framework for Breakthrough Performance and Extraordinary Business Results. Bob created The Leadership Circle Profile, a 360° assessment used by organizations the world over to measure the effectiveness of their leaders. In 2005, the Stayer Center for Executive Education at the University of Notre Dame Mendoza College of Business awarded Bob the Partner in Innovation Award. The MEECO Leadership Institute awarded him the International Thought Leader of Distinction in 2018. Bill Adams is the co-founder and CEO of Full Circle Group and The Leadership Circle. Bill has over 30 years of experience as a trusted advisor to CEOs and their teams around the globe. He partners with leaders to unlock breakthrough performance, develop deep leadership capability/capacity and transformational business results. Bill works with leaders as a leader himself that is learning and growing. Bill co-authored Mastering Leadership: An Integrated Framework for Breakthrough Performance and Extraordinary Business Results, The Whole Systems Approach: Involving Everyone in the Company to Transform and Run Your Business (with co-author, Cindy Adams) and The Quest for Quality: Prescriptions for Achieving Service Excellence. Scaling Leadership distills lessons from successful leaders into a powerful and universal leadership framework that will let you chart your specific path of development. This book will get your attention. It will evoke and provoke you. It will ask you to deeply reflect on your own personal balance of leadership strengths and weaknesses. It will challenge you to evolve your leadership in deep relationship with others and with exceptional integrity. Mastering Leadership offers a developmental pathway to bring forth the highest and best use of yourself, your life, and your leadership. By more meaningfully deploying all of who you are every day, individually and collectively, you will achieve a leadership legacy consistent with your highest aspirations. Breakthrough research that connects increased leadership effectiveness with enhanced business performance. The first fully integrated Universal Model of Leadership—one that integrates the best theory and research in the fields of Leadership and Organizational Development over the last half century. Thanks! You’re in the loop!